Newbie for cannabis and very glad to have found this online resource. We farm here @ 44'N in Maine so we have a lot of infrastructure already (insulated greenhouses and high tunnels) so we are going with what we know (and have) and not investing in lights etc. 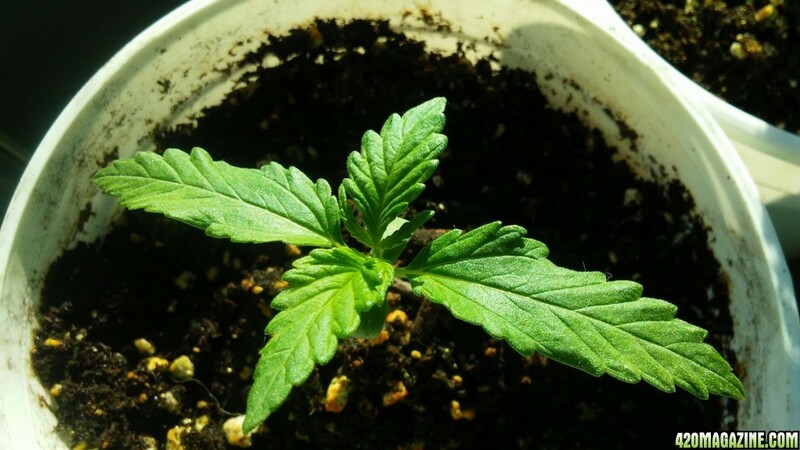 Maine just passed as law that residents can grow, at any time, twelve (12) mature plants, six (6) flowering plants, and unlimited seedlings. Which is awesome. Also, we are allowed to give away 2.5 oz at any time (and no limit to transactions) to any 21+ adult (without $ in return). Well, there is already a strong barter culture where I am so this, again, is awesome. 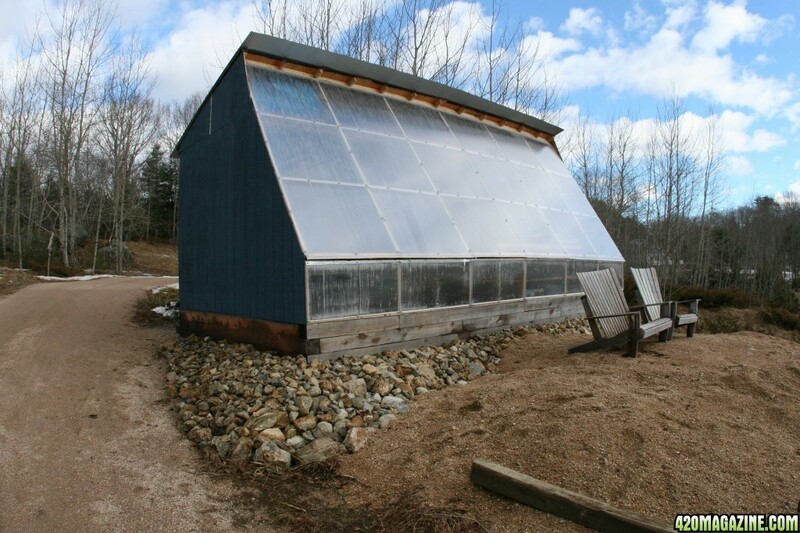 We have a 12x24' passive solar greenhouse that we normally use for cucumbers and tomatoes but this year we are going to dedicate it to 8-10 cannabis plants and see how we do. 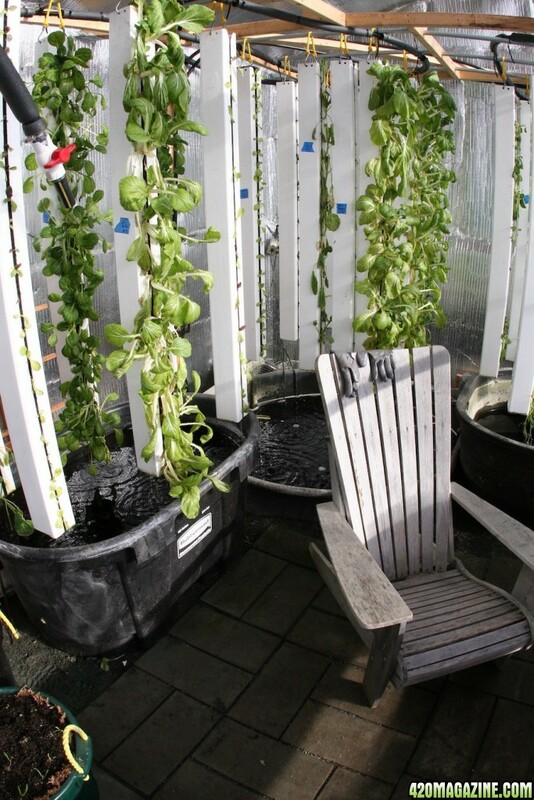 As you can see from the attached photos we use aquaponics and, while we plan on using cloth bags this year, it is a nice resource for nitrogen rich watering! 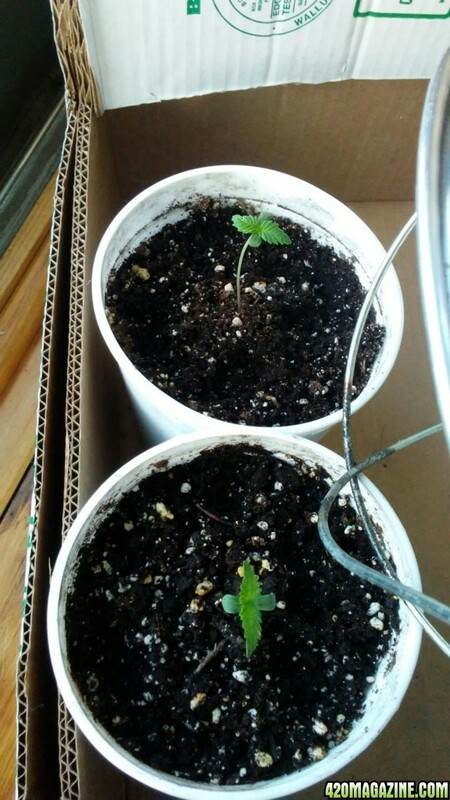 Have eight (8) beans which are four (4) of Northern Light Auto and four (4) White Widow Photo. I figured I would play with both and see how they responded to my particular circumstances. Got too excited and germinated one of each on Feb 28 and days late both popped (thanks CKS!). 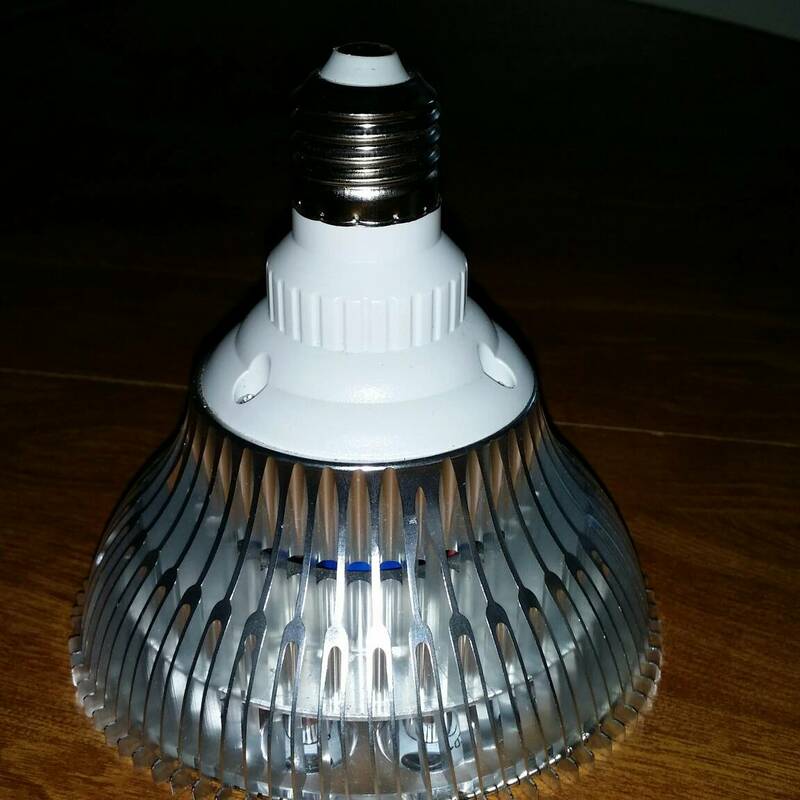 Since days are still lengthening here, I have a 100W CFL hood lamp (from the chicken coop) supplementing until 7pm (so 13 hours daylight). Hoping to transfer these into 2 gallon cloth bags and up-pot to 5 and then 10 gallons. Slowly but surely they are getting there. We had 2 weeks of 35-45F so I was overly optimistic that I could get them in the greenhouse if that kept up. It hasn't. Currently 7F (-2 with wind chill) and they are saying 12-16" of snow likely next week. 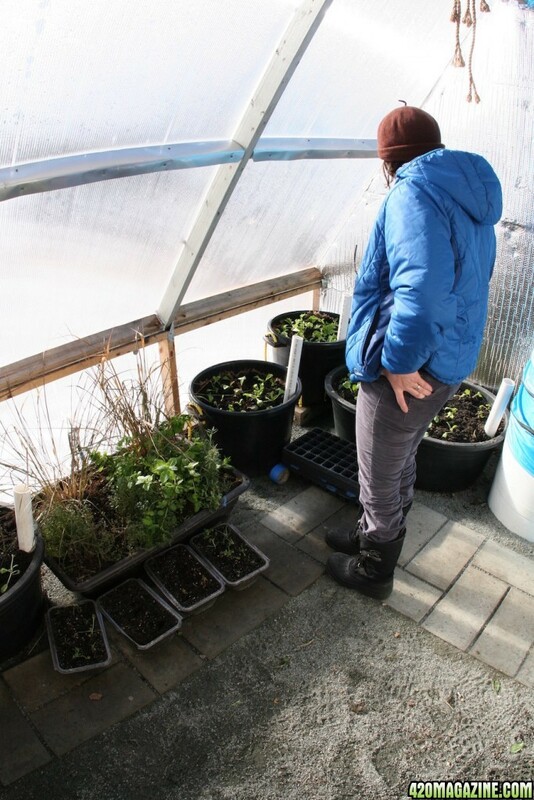 We can still grow lettuce with wind and snow, but I am doubtful these girls will want to see anything below 60F (which we can maintain when temps don't drop below 40F). 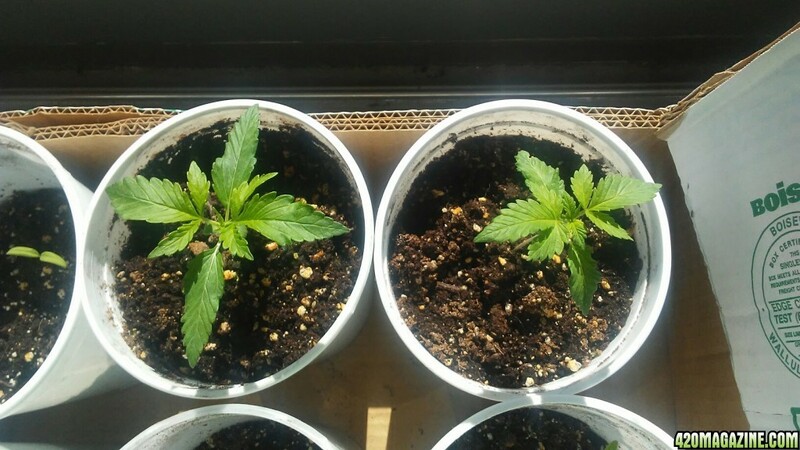 This is an experiment and why I only started 2 seeds out of 10. I plan on trying the same start for both possibly end of this month. If anyone has advice on low temps re growth issues please share. Thanks. Agreed. Right now they are inside @ 70F+. Well, the good news is I will likely have sufficient coolness in 8-9 weeks. The NL is an auto, so it will follow its own schedule. 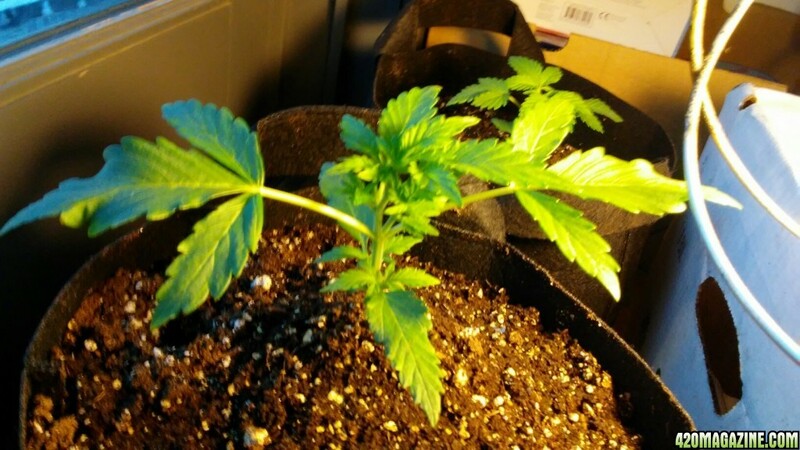 The White Widow is photo and my plan was to see how much bigger I could get it by an early inside start. Wow that greenhouse is really neat looking! cant wait till you can get to start growing in it. 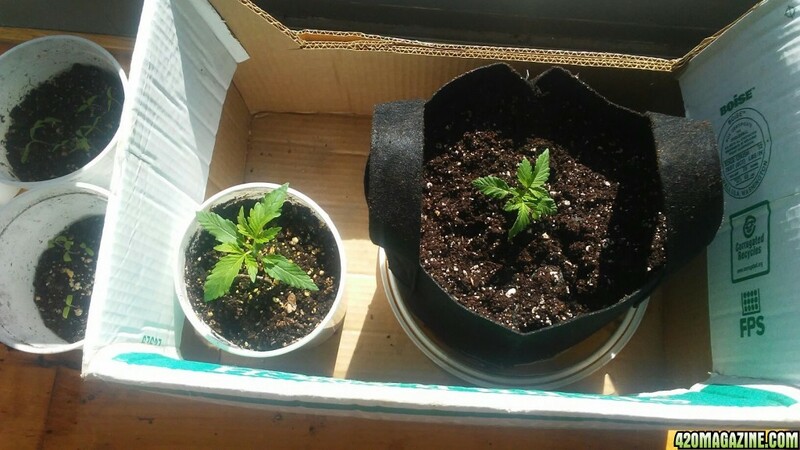 My wife and i have wanted to move to maine but the cold and distance have deterred me from making a game plan.. never seems like a bad option though when you can grow legally! Few pics of the interior. Chair is for sun therapy in the Winter...we do get some long dark days, and if the sun is out is always 70F+ in the GH. Haha that sounds like the life man.. im mostly in it for the personal use but i would love to share if i could grow that much. Looks awesome thanks for the pics and the info! Ok, tomorrow will be a week from my last photo of the WW and NLA. 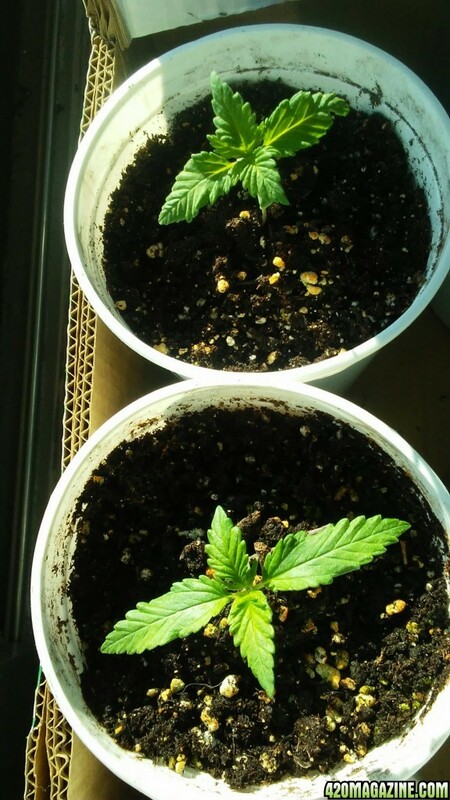 They seem to be doing fine and I have only watered them once about 3-4 days ago. We got 10" of snow on Tuesday and temps are back up to 33F in the day. Hoping for those temps staying consistent, and warming, in the coming weeks so I can transfer to greenhouse. GH can maintain a 60F temp overnight when the exterior temp does not go below 35F. 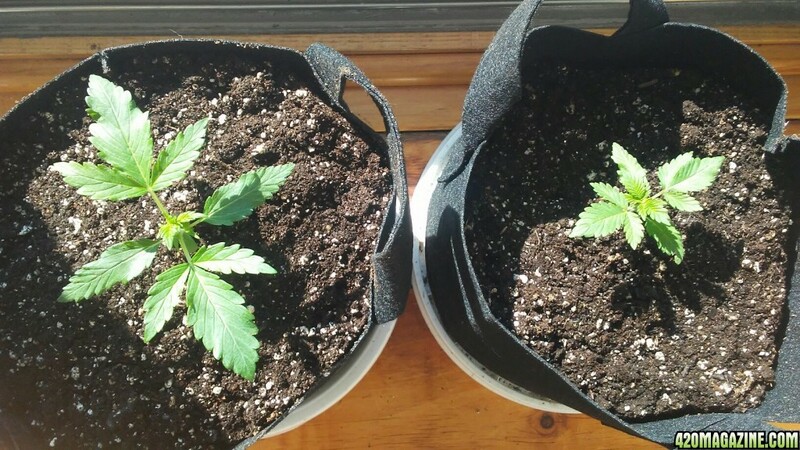 Finally got some clear, sunny days and girls looked happy so I took a chance and repotted the White Widow into a 3-gallon fabric pot. I haven't used these before, so I am curious. Ultimately I am putting the WW into a 25 gallon fabric in the greenhouse, so this pot should be good for another 4-6 weeks (??). I used Pro Mix and a couple big handfuls of our secret stash worm castings so hopefully there are plenty of nutrients for a week or so. By then hopefully we will have our greenhouse aquaponics running and I can use the N rich water from the fish to water the WW. 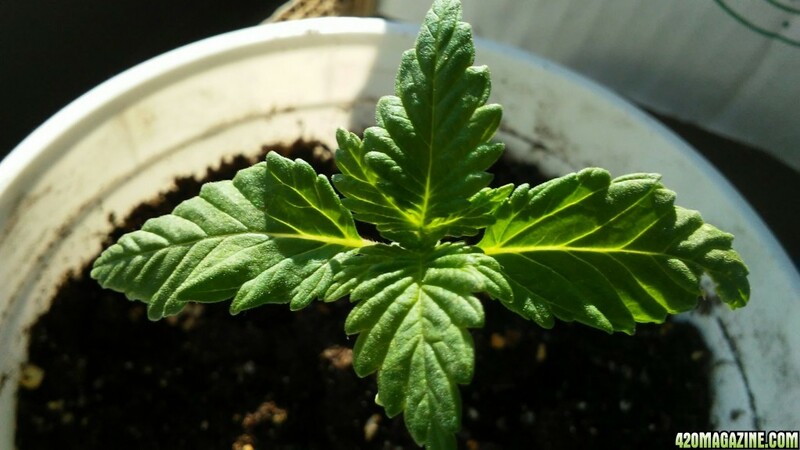 I am going to repot the Northern Light auto when I get my 5-gallons later this week (hopefully), and then just let it ride the whole way in it. The current containers used are 3-quart deli containers we get for free. So fish water is okay to use for your plants? Ive heard people say they will use it for the n but i see it doing more harm then good i guess. Heya Blue. We're neighbors. We have our outdoor grow every year up here. We like to put em out in the open first week of June. No pots either. Pots are for inside here. Anyhow, I bet ya can get yours into that green house first week of May. Might seem a bit too early but I'm telling you that green house buys youa couple three weeks. I jump the gun almost every year by at least two weeks too hey em in the dirt. For real. I can't wait. It's funny to see me out there with garbage cans and buckets n whatever else I can get my hands on covering em up due to late Frost in mid May. 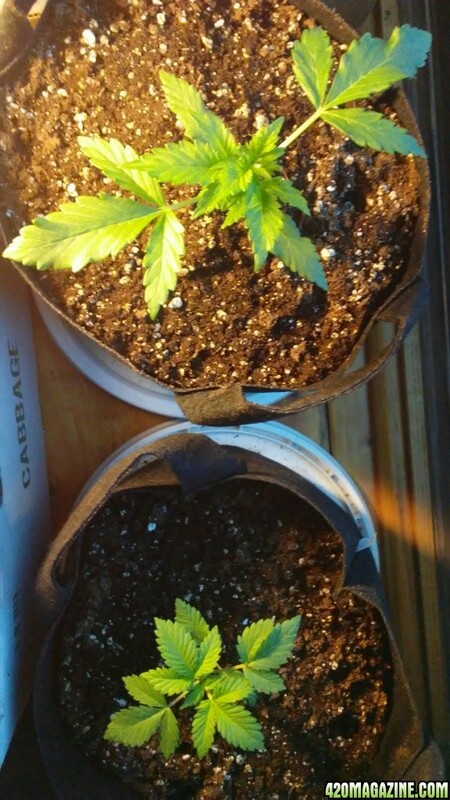 I haven't lost one ever, to the elements, but a couple have been stunted for a week or so. Those bounce right back and yield like all the others. Remember, a few of mine are right out in the middle of some fields and scattered around but for the most part exposed. An auto I would be a little more cautious with for obvious reasons. But the photos they can take it. Oh yeah this place is amazing. You'll be a pro soon. So much to learn and enjoy. Don't hesitate to ask anything. Have a good one and great luck in all of your growing. We are all Born unwilling and we all Die unwilling. It's what we do with our willingness to live, in the in between, that makes it worth the trouble. My wife says there is always a risk until after the first full moon of June. 9th this year up here. Not worries for you though. To be checking the temps of the ground inside gh. I never done any gh growing but one is going up this year for us. Small one but one nonetheless. 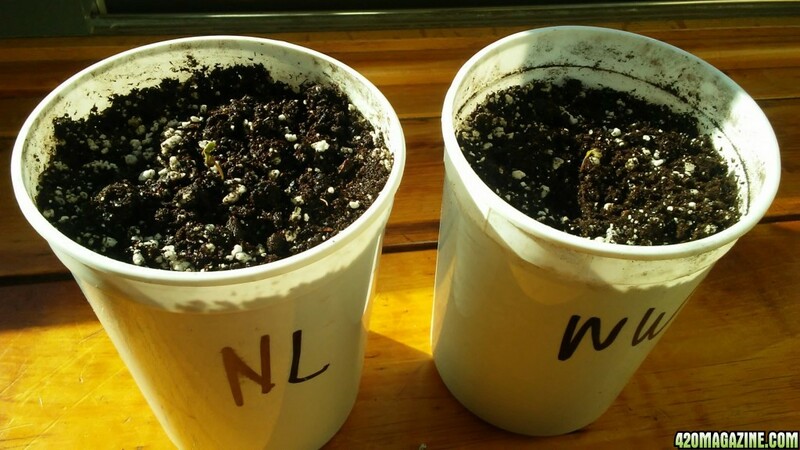 Decided to put the NL auto into a 3-gallon fabric pot (because I had them) and did that Tuesday, then we got 4" inches of snow (and no sun) yesterday so was worried about shocking. Nothing so far, looks happy (NL on left). To bad you don't have a little stronger​ light to supplement with. 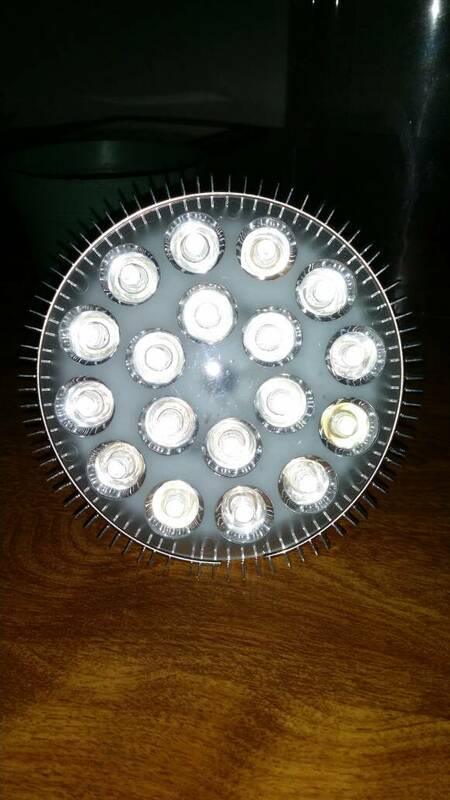 I used an LED from the Bay, 54 watt, 18 bones, that would be just right. It's a screw in deal but worked the nuts when I first started inside. Works even better for clones. Great looking little plants considering. That Auto really needs light right now IMHO. Those things are on a virtual timer. They need all they can get.